If you have a smartphone, there are many apps available that can tell you when buses or subway trains will next arrive, show you bus routes, and warn you about delays or service changes. Google Maps can give you directions that only include public transport options. These include departure / arrival times, and show multiple routes so you can choose what’s easiest for you. “Link Passes”, available in weekly (7 days from time of purchase, for $18) or monthly (the calendar month you’re in at time of purchase, for $70) form, provide unlimited bus and subway rides for their duration — you can get these at any ticket kiosk, and they can save you a ton on bus and subway fare. There are other passes available that include unlimited commuter rail rides. The MBTA is on twitter! Their main account and the Transit Police are two official accounts that regularly tweet and respond to commuters. And monitoring the #MBTA hashtag provides useful info, funny observations, and company for your occasional misery. 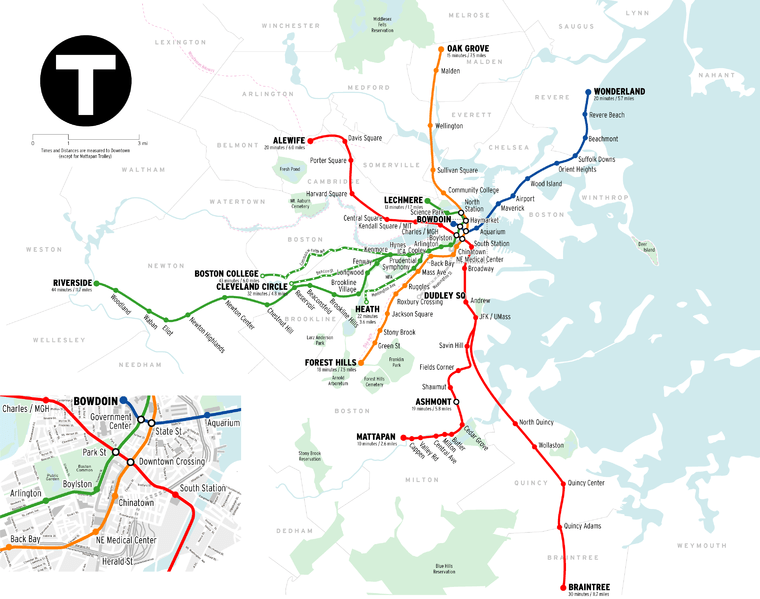 Take a look at some more detailed maps of the MBTA. We’ve all seen the subway map plastered in every T-station, but how about a geographically-accurate version of it (shown above)? Or a time-scale map of it? Or get a sense of just how many far-ranging, interconnected bus routes there are with the MBTA’s full-system map. And just for kicks, take a look at Super MBTA World.